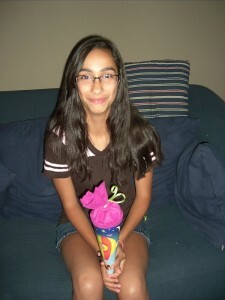 The very awesome Vivian from Kindercone.com contacted me after seeing my previous posts on the Schultuete (German school cones) that I give my kids each year. 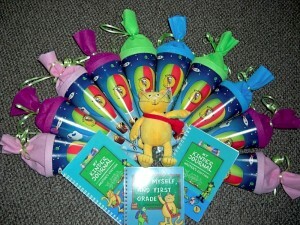 She sent me a great package that included a set of Mini School Cones, Kinder Journals, a Karli the Cat plush, KinderCone bookmarks and KinderCone tattoos. 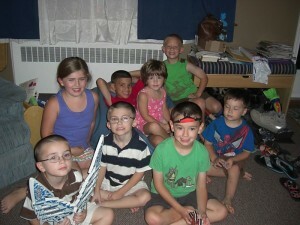 I was so excited to receive this package and share it with some of my friends and their children. Many people have seen my kids with their cones on the school playground and have asked about them. I love being able to pass on this fabulous German tradition. The tradition of the Schultuete or “school cone”, which dates back over 200 hundred years, is one of the most celebrated and long-standing traditions in Germany. At the beginning of every school year, children all over Germany set off with their large and shiny Schultueten, also called school cones or sugar cones by many. These large, colorful school cones, purchased or home-made, sweeten the child’s first day of school as they come filled with little gifts, school supplies and sweets. 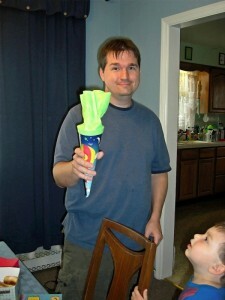 We decided to invite some of our friends over for a Back to School Party and give out our cones. 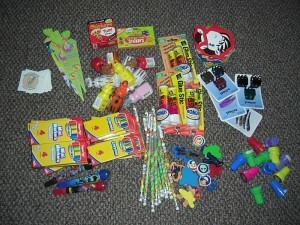 I filled them with pencils, erasers, bubbles, pads, the bookmarks and tattoos from KinderCone and few other small things. We didn’t do anything too fancy. We served some snacks and the kids played. We had originally planned to be outside in the backyard, but unfortunately, the weather did not cooperate with us. 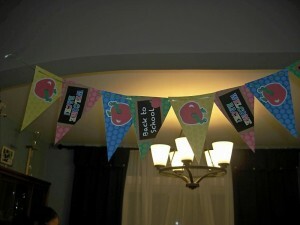 I used a bunch of free Back to School printables that I found on Pinterest to decorate. After a few snacks, it was time to hand out the Schultuete/School Cones. The kids were so excited to open them and find out what treats were inside. The big kids had fun checking out the School Cones! Big Kids Love School Cones! Some Adults were a little jealous of their kids’ School Cones. 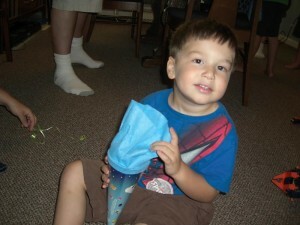 All in all, the kids and parents had a great time at the party and receiving their first ever School Cones from the very awesome KinderCone.com! Next year, I suspect we won’t be the only ones with our cones on the playground! Thanks again, KinderCone. YOU ROCK! Bilingual Babes has also posted about school cones. Check out her homemade ones! They are great. School Cones (Schultuete) from KinderCone.com has been posted in For the Kids, For the Parents and Tagged: first day of school, german, german school cones, german traditions, KinderCone, school cones, schoolcones, schultuete. As class mom, I wanted to give the kids a little something at the end of school. However, I didn’t want to fill a bag with candy or crappy little toys. So, I decided to make them a useful, little safety bag. 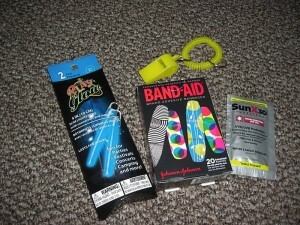 In the bag, I included a 2 pack of glow sticks with lanyards purchased at the dollor store, a box of funky patterned bandaids scored on Woot.com for dirt cheap, a suncreen lotion wipe purchased in bulk on Amazon, and a bracelet whistle purchased from Oriental Trading. 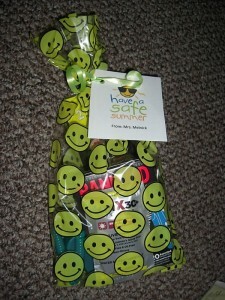 I attached a tag I made using a graphic I found on Google Images that said “Have a Safe Summer!”. 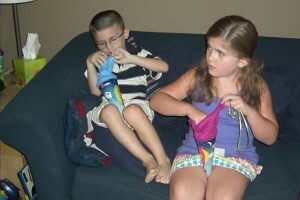 End of School Class Mom Gift to Kids has been posted in Awesome Crafts, For the Kids and Tagged: class mom favor, class mom gift, end of school favor, end of school gift, have a safe summer, safe summer, safety favor, safety gift. I don’t know exactly where I saw this (Pinterest, perhaps?) but whoever came up with this idea…..PURE GENIUS. 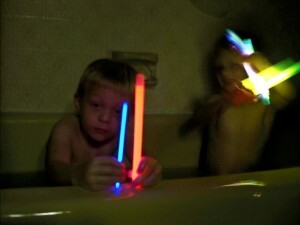 RUN to the dollar store and pick up some glow sticks (any kind will do). 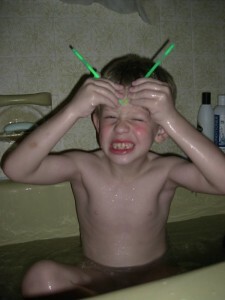 Crack ‘em and throw ‘em in the bath. Turn off the lights. Figure out how to get the flash on your camera to work properly in the dark. Watch your kids have a BLAST! You’re welcome. 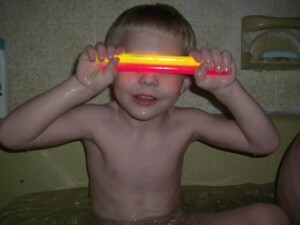 Glow Bath = Cheap Fun has been posted in Awesome Crafts, For the Kids and Tagged: bathtime fun, cheap fun, dollar store fun, glow bath, glow sticks in bath, summer fun. 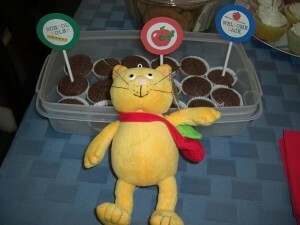 Each year, I like to give my childrens’ teachers a gift for Teacher Appreciation Week, as well as the end of the year. This simple, inexpensive gift could work for either. For my younger son’s 3 nursery school teachers, we used these adorable chalkboard plant markers and planters that I found in the dollar spot at Target, along with some pink geraniums. 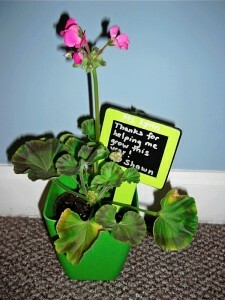 I purchased the geraniums in a 6 pack at the grocery store for $10 right before Mother’s Day, which conveniently coincides with Teacher Appreciation Week (You could also use these for Mother’s Day by simply altering the chalkboard message!). On the marker I wrote “Thanks for helping me grow this year” using a paint pen (found at AC Moore) so it wouldn’t come off. For my older son’s kindergarten teacher and aide, I purchased flattened silver spoons that had the phrase “Teachers plant seeds of knowledge that will grow forever” pressed into them (from JLynnCreations on Etsy). 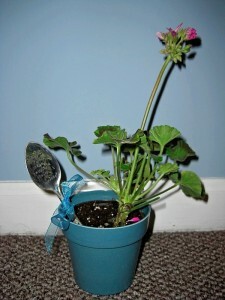 "Teachers plant seeds of knowledge that will grow forever"
We packaged each plant in a gift bag from the dollar store. Such simple gifts and we received nothing but thank yous and compliments from all of the teachers. Teacher Gift - Plants has been posted in Awesome Crafts and Tagged: end of year teacher gift, gifts for teachers, teacher appreciation gift, teacher appreciation gifts, teacher gift. The very awesome Sofie of The German Foodie worked with me to try and recreate a German recipe from my childhood. The “Hausfrau” (german for house woman), Frau Krauth, that lived in the apartment under my aunt always had a “Zuckerkuchen” (german for Sugar Cake) ready for me when I arrived for my summers in Germany. It was a heavenly cake - sort of a cross between a custard and a cheesecake. I can still almost taste it in my mouth when I think about it. Unfortunately, when I hit the internet searching for a recipe, I couldn’t find anything like it. 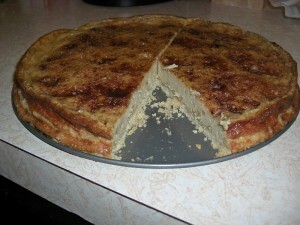 I found many recipes entitled Sugar Cake, but nothing that was like Frau Krauth’s. 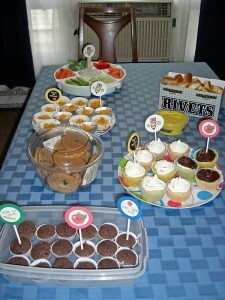 When I found Sofie’s blog, I emailed her to see if she was familiar with this type of cake. It turns out that she is from the same area in Germany where my family lives. After a few email exchanges, Sofie put together a recipe for me. I modified it to fit my dietary needs. 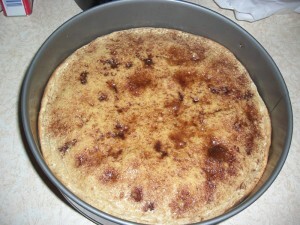 Here is the gluten-free, corn-free, soy-free, closest version of the famous Zuckerkuchen that we could come up with. ENJOY! Combine all ingredients for the crust into a mealy, cookie-like dough. Let it rest in the fridge for about 20 - 30 minutes to give the butter a chance to firm up. Combine all ingredients for the topping, leave out the starch. Beat thoroughly until thick and creamy. Sift the starch on top. Put mixer on low speed and keep stirring until starch has been incorporated. Preheat the oven to 350 F. In a greased 9″ springform, roll out (or just press into pan) the entire crust dough on the bottom, prick a few times w/ a fork. Pour the topping into the form and smooth out. Sprinkle the sugar/cinnamon mixture on top. Zucker Kuchen (German Sugar Cake) Recipe has been posted in Tasty Foods and Tagged: corn-free recipe, German Sugar Cake, gluten-free recipe, kuchen rezept, soy-free recipe, Zucker Kuchen, Zucker Kuchen rezept.